About a year later, after moving to Washington DC, luck (or Divine timing) allowed me to meet someone who helped me make some basic changes to my diet (i.e., clearing out common irritants like wheat and dairy) and introduced me to some natural supplements to support digestion and reduce inflammation. I was skeptical at first, but a few months later, my symptoms had completely disappeared. The improvement to my quality of life was so immediate and profound, it felt like an actual miracle. In the long process of looking for answers to this stomach condition, I realized that none of my doctors had asked me what I was eating. NOT ONE. And after all that suffering for all those months, I had completely healed myself through what seemed like the most obvious place to look: food. I knew I'd found a new passion- and calling- to help others do the same. Studying from teachers like raw foods expert David Wolf during my training at the Institute for Integrative Nutrition. This experience inspired a completely new professional path. I left my environmental non-profit job and went through the Institute for Integrative Nutrition’s health coaching program where I studied all the major dietary theories and received my training as a holistic health coach. I eagerly started my health coaching practice in DC, working with individuals and groups, and leading workshops and trainings at local companies and schools, guiding my clients to lead more aligned and energetic lives by making changes to their diet and lifestyle. It felt like the most rewarding work I had ever done in my life, seeing the way people could improve the quality of their lives by simply substituting healthier options on their plate and eating in a way that was in true alignment with their unique needs. At this point, supporting my amazing new clients, my innate entrepreneurial spirit started to take on a new life of it’s own. I listened as they desperately wanted to make changes to their diet but had no time to do the things critically important to healthy eating: mainly, grocery shopping and preparing meals made with real, unprocessed food. And in 2008, there weren’t a lot of convenient, healthy options for people who didn’t have time to cook (the meal delivery craze hadn’t started yet and you were lucky if you lived anywhere near a Whole Foods. The struggle was real back then!). With the nudging-- actually begging-- of a few of my clients, I decided to try and create a solution to this clear, unmet need. In January 2009 at the age of 29, my company Healthy Bites was officially born. 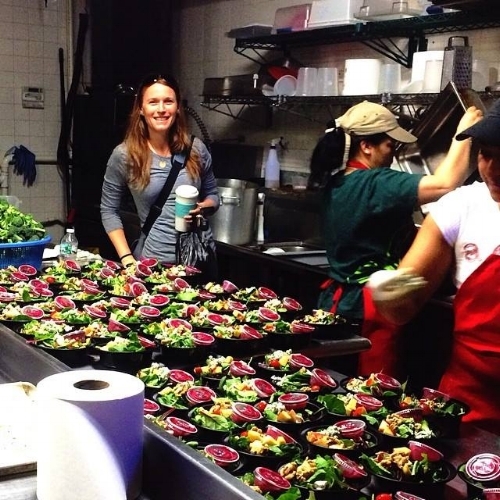 Healthy Bites was the first (mostly) locally-sourced, organic, healthy meal service in the DC Metro area, delivering fully-prepared meals (breakfast, lunch, dinner and snacks) to clients for three to four days at a time. I launched this venture from pure passion and a deep desire to support my clients, but I quickly realized that I had NO EFFING IDEA how to run a food business, let alone a food business that was essentially a logistics and delivery company. I was bootstrapping it with the best of them, but the learning curve was steep and as a pioneer in the industry, there weren’t many acts to follow. I sacrificed everything to get it off the ground: sleep, sanity, my finances, and basically, myself. I was in the process of learning that this is all part of the hero’s journey of an entrepreneur. Salad prep in the Healthy Bites kitchen. Slowly, but surely, Healthy Bites began to grow. I hired more people and built better tech (actually, two of my friends built it in exchange for free food). I expanded into my own commercial kitchen and opened a small cafe in a local neighborhood “food desert,” offering fresh and healthy options to a community that only had access to fried food and crappy carry-out. I created jobs for people that lived in that neighborhood and offered work opportunities to those with high barriers to employment. I rented space to other female food entrepreneurs and advised and supported them to get their businesses off the ground. I was wildly overwhelmed and overworked, but I could see the ripple effect my business was having in my community. And it filled me with purpose. About two and half years in, with some solid growth and traction in place, things took a dramatic and unexpected turn. My business partner revealed his true colors and I discovered that his fraudulent financial actions (and inactions) had created what I estimated to be several hundred thousand dollars in vendor and tax debt. My intuition had been screaming at me for months that something was terribly "off" but I had been far too busy juggling my responsibilities during a period of intense business growth to fully pay attention and get to the bottom of it. Now the bottom had dropped out, and I was in a financial and emotional free fall I had no idea how to begin to process or experience. I did my best to absorb the shock and betrayal so I could function, had my husband install a punching bag in my office to help me cope with the constant, often crippling anger, and surrounded myself with people who could help me calmly and quickly understand my legal options. When it became clear bankruptcy wasn’t one of them, I was advised to choose the only one that was: legally remove my partner, keep running the business solo, and hopefully- somehow- dig myself out of the mess I was in. The only way out was through. So, through that door and down that path I went. I gathered my staff (now already six weeks behind on their pay), explained what had been happening, and summoned my most sincere Jerry McGuire-style monologue to ask them to come with me, knowing the only way we would succeed (and the only way I would ever pay them back) is if we stayed in production and continued to generate revenue. Every single person said yes. Someday I will write the whole sordid story of how the rest unfolded, but the cliff notes go like this: my former partner was a far more villainous character than I could have possibly imagined and the fires to put out were so numerous, life simply became blinding. I had no idea how to handle the intensity of the situation I was in-- and the corresponding level of fear, anxiety and financial stress-- and it felt like a constant state of trauma. And it actually almost killed me. My adrenal system started shutting down. I was experiencing the deep, dark hole of severe depression. I wasn’t sleeping and didn’t want to get out of bed. I rarely wanted to eat (sheer irony, for obvious reasons) and continued to lose weight. And I had to keep showing up day after day with my CEO hat on and hide it all in plain sight. Knowing that giving up wasn’t an option, I slowly began to see that the only way I was going survive was to truly start taking care of myself in a way I never had before. Kitchen and cashier team at Healthy Bites. It was on my walk down this traumatic trail that I finally started to come home to myself. I re-aligned my priorities and learned how to ask for help, which often started by admitting that I wasn't okay (which, I learned, is a very hard thing for the leader in me to do). I leaned hard on my amazing team. I said no to non-urgent commitments so I could say yes to myself. I made extra-nourishing food (and lots of green juice on the days I didn’t want to eat), devoted myself to my yoga practice, found a coach to support me emotionally and mentally, deepened into my spiritual practices, and clung to my new self-care routine like my life depended on it (because, truly, it did). I began to understand that my health and wellbeing was the actual foundation of the business I was building. If I couldn’t buoy myself, the ship would sink. I’m ever-proud to say that I kept myself, and Healthy Bites, afloat. It took me over four years, but I found the right people to help me (including a tax attorney who literally saved my financial life), paid back the debt, righted all the wrongs, and continued to grow my business year after year. In the process, I began to lay the groundwork for my eventual departure. Even though I had saved my company and immensely contributed to my community, I was completely exhausted and burned out from the experience. I felt like I had run an ULTRA ultra-marathon in an itchy wool sweater and all I wanted was to get to the finish line, take that thing off and never see it again. My heart also told me there was other work I needed to do. In 2015, almost seven years after starting Healthy Bites, I was able to exit through an acquisition by a growing local meal delivery company with a mission-aligned service. My clients continued to receive delicious, healthy food. My employees found new homes. My cafe transitioned to a new female food entrepreneur. And I packed up and moved to San Francisco to start a new life. Support on the self-care path. Wandering on a redwood path in Northern California. After taking some time to heal and recharge, I've realized that much like changing our diet, we can dramatically improve the quality of our lives by simply letting go of the belief that prioritizing ourselves is somehow selfish and that we are a sacrifice to the life we are creating. This is especially important for entrepreneurs and anyone who is brave enough to take risks and forge new paths. Self-care is never selfish. It is the absolute foundation of the brilliance and resilience required to do hard things (or even easy things, for that matter). When we love ourselves enough to deeply take care of ourselves, everything and everyone in our life benefits. Because you can never truly give to someone else what you aren’t able to give yourself first. This new, lived understanding has inspired me to take all that I’ve learned, and learned how to apply, to create a coaching and consulting practice that supports entrepreneurs, executives and heart-centered creators to put on your oxygen mask and fill up your tank- and to let go of the guilt and shame when you do. To help you create holistic habits and practices that honor your body's wisdom and amplify your light so you can stay on the path of passion and purpose without losing yourself-- YOU, the actual foundation of your life. Everyone deserves support along their path. Sometimes we need a guide (and a cheerleader) too. And I will be truly honored to hold a flashlight and walk with you, along the way. I have come to believe that caring for myself is not self indulgent.